The usual Opera Boys line-up. For this show, Colin Bryce (second right) was replaced by Nathan Winn (not pictured). Susan Welsh saw The Opera Boys at the One Touch Theatre, Eden Court. Figaro’s aria, that fast-paced tongue-twisting number from The Barber of Seville was a good choice of opening number for The Opera Boys concert at Eden Court. It gave their vocal chords a good workout and let the audience see that individually each gent sung well, but together were superb. 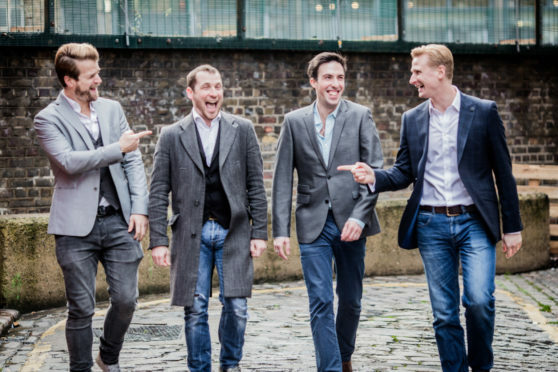 All four boys, we learned, started out singing in church choirs, then progressed to appearing on stages everywhere from Butlins to Broadway. Rob Cherry introduced himself and the other members of the polished quartet – Richard Colvin, Michael Storrs and Nathan Winn. But where was Colin Bryce, who was billed to appear? I’ve since learned Nathan was standing in for Colin for the happiest of reasons, as his wife gave birth to a baby yesterday. That aside, everything was as it should be as the lads took the audience on a whirlwind tour of popular opera and classic music numbers, with a few much-loved tunes from hit musicals such as Les Miserables and Phantom of the Opera, and the pop charts thrown in for good measure. The boys are masters at audience engagement, to the point where at one point it veered dangerously close to panto, but being encouraged to sing and clap along, something you wouldn’t normally do at a classical music concert, made for a fun evening. Personal highlights included Brindisi, aka The Drinking Song from La Traviata and Funiculi, Funicula and That’s Amori, while the tempo and atmosphere changed quickly with songs such as Speak Softly Love (the theme tune from The Godfather) and Bring Him Home from Les Mis. Referring to, La Donna e Mobile from Rigoletto, as a song about a woman on her mobile phone, for example, made this an excellent show for introducing non-regular opera and classic music fans to the genre. A brilliant, melodic version of Nessun Dorma closed the show before the audience demanded they return to the stage for an encore which ended with an upbeat version of Oh What A Night from The Jersey Boys. Good music and cheery banter with the audience made for an excellent way to spend a Sunday evening.